If you are planing to warm up your home in more efficiently way or improving interior design of your home, underfloor heating project might be exactly what you are looking for. Whether the underfloor project is for whole house, the ground floor or multi room extension, our expert will consider all the elements when designing your bespoke system. The room temperature is highest at the ceiling and coldest at the floor. Excessive air circulation increases ventilation looses, making fuel cost higher. Boiler has to be set of 1 or 2 degree higher than with underfloor heating to achieve desired temperature. Multi layered UFH tubes provide warmth and eliminating droughts and dust movements. Radiators free rooms have bigger space, enable flexibility with interior design. Boiler works more efficiently up to 25% which saves you both energy and money. How does underfloor heating work. 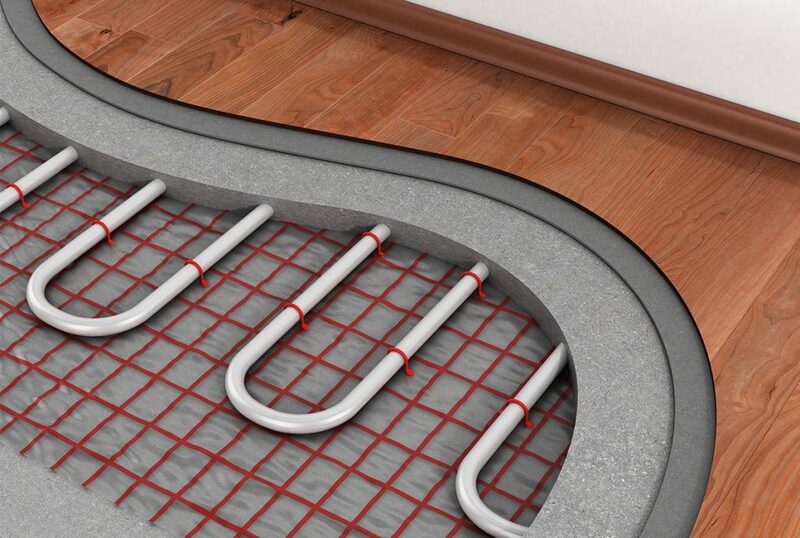 UFH tubes emended in the floor controlled from any heat source (boiler or heat pumps) by pumping flow of warm water, sufficiently and fast making whole floor surface to reach optimum temperature to heat the room. Most of clients choose to install the system at the ground floor, kitchen and bathrooms. Whether your house has jointed timber floor or solid one we will provide a bespoke design for each and every project.